When I found out that Spyderco had re-released their top selling Delica and Endura in VG-10 steel and full-flat ground blades, well I just had to jump in. These are some of the most economical and yet rugged pieces that they make. Delica is perfect for light use; Endura has a nice length for general purpose and camping. Very lightweight, very flat profile. Reversible clip for leftys like me. When is a Spyder not a Spyder? 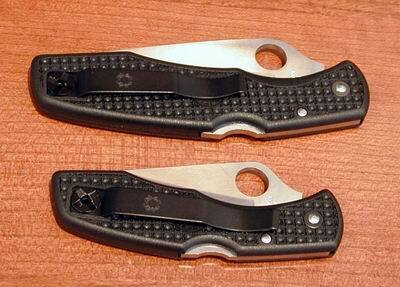 One of the more rare models that Spyderco produced was a collaboration with Jess Horn. 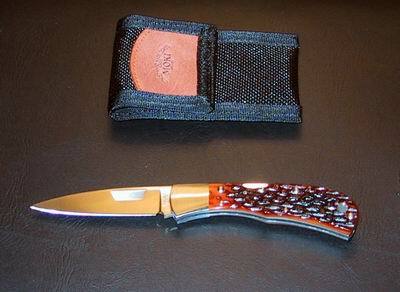 The knife retailed for around $450 MSRP, and the manufacturing process was difficult. Instead of the usual thumbhole, there is a trapezoidal indent on both sides of the blade, with the machined metal in the middle only a few thousandths of an inch thick. The bone handles are made from the tough jawbone of a cow and jigged for aesthetic effect and grip. I recently stumbled across this “remake” from Moki (a premier manufacturer in Japan), at a bargain. Matches the kiwi nicely, I think. This is also my first piece that uses ATS34, but it probably won’t see much hard use. Nice to have options for formal bladewear.